New hotels and ratings upgrades to existing accommodation bode well for hotel market into the future, latest Savills report notes. Savills has reported that Ho Chi Minh City will see 16 new hotel projects from 2017 to 2019 supplying approximately 3,500 rooms. More than 700 rooms from five existing three- to four-star hotels are also awaiting ratings approval. In the fourth quarter of 2016, one three-star hotel completed renovations and five new three-star hotels supplied more than 440 rooms. “Ho Chi Minh City’s hotel stock was more than 15,900 rooms from 130 projects, up 3 per cent quarter-on-quarter and 8 per cent year-on-year,” the report stated. Average occupancy was approximately 69 per cent, up 3 ppts quarter-on-quarter. 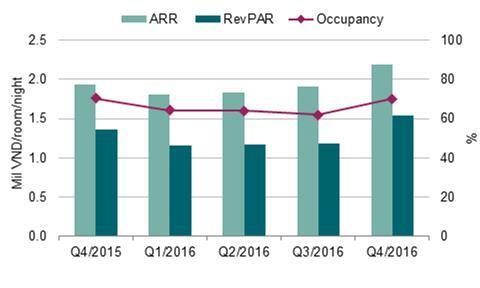 The average room rate (ARR) was VND1,890,000 ($83) per room per night, up 1 per cent quarter-on-quarter due to ARR increases in all segments, but decreasing 3 per cent year-on-year. In 2016, Ho Chi Minh City set a new record of 5.2 million international visitors, increasing 13 per cent year-on-year and accounting for 52 per cent of arrivals to Vietnam. Meanwhile, Hanoi’s hotel stock increased 1 per cent quarter-on-quarter after the re-entry of one three-star hotel and the withdrawal of another three-star hotel for renovations, but fell 3 per cent year-on-year. Sofitel Plaza Hanoi was officially rebranded Pan Pacific Hanoi. Average occupancy was up 8 ppts quarter-on-quarter due to the peak season but relatively stable year-on-year. The ARR increased 12 per cent quarter-on-quarter and 9 per cent year-on-year. RevPAR increased 27 per cent quarter-on-quarter and 9 per cent year-on-year. Hanoi recorded 4,000,000 international arrivals in 2016, up 23 per cent year-on-year and accounting for 40 per cent of arrivals to Vietnam. The country also catered to more than 62 million domestic travelers this year, with total revenue estimated at VND400 trillion ($18 billion), according to the Vietnam National Administration of Tourism (VNAT). Vietnam welcomed its 10 millionth annual foreign visitor for the first time on December 25 at Phu Quoc International Airport off the coast of the Mekong Delta’s Kien Giang province. This was the first time Vietnam has welcomed 10 million international arrivals in a calendar year and represents an increase of 25 per cent year-on-year. 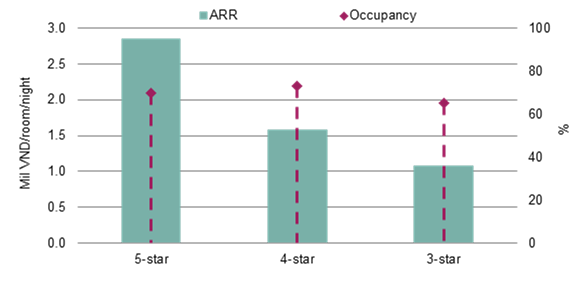 Visitor numbers from Northeast Asia and Western Europe rose remarkably.